As per request from friends, and since I have not been calling home recently, let me briefly update what I have been up to. I have been back to Toronto for more than two weeks now. Although I have been away for half a year, interestingly, I still remember the details of this city. Only when I was lost and got off at the wrong subway station has reminded me that I have been away for a while. Other than that, things are the same – Ed remains the same (haha, yup 😉 ) , and there isn’t much changes in our home, I feel as if I have never left here. Oh yes, the only one huge difference is, there is no traces of snow on the street, and I don’t have to wear layers of clothing anymore. Yay! 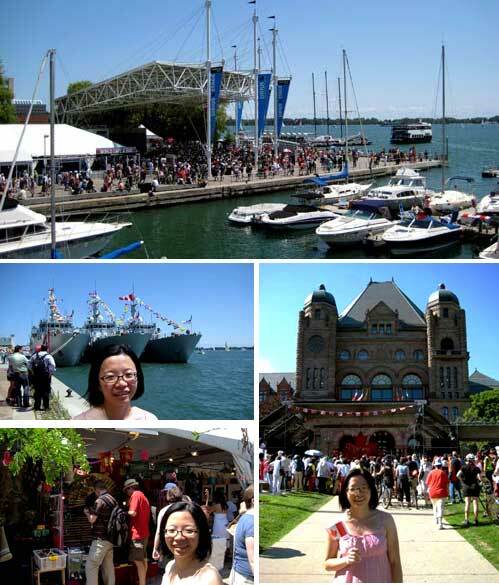 The first week I arrived Toronto, I was struggling with jetlag and Ed was sick. He took a sickie and the weather was rainy, so we stayed home, either watched movies or just slept like a baby. The good thing is, most movies we watched (like Helen Mirren’s Elizabeth I short series, Juno, La En Vie Rose, and of course the new absolute gem from Pixar – Wall-E) are pretty cool. So, we were happy. The second week, the weather turned fabulous, clear and sunshine. Ed had recovered and I wasn’t sleepy during the day anymore, plus it was Canada Day long weekend （pictures above), we finally ventured out from home. We caught up with family and friends, walked around downtown, and I saw the summer madness here. Now, entering my third week here, life is getting back to ‘normal’. Ed goes to work five days a week as usual, and I stay home doing not too much, cleaning, cooking, surfing, chatting online, blogging (finally) ….yup, doing them ‘leisurely’ too. Frankly, I have a long to-do-list and plenty of plans, for example, looking for new apartment to move, sending application for Pharmacy Registration exams, preparing the exams and etc. Well, I am trying hard to work on them, but procrastinatingly, as usual…..
For the past few days, I have been busy with setting up and reorganising files in my IMAC from Australia. This IMAC is quite old, not worth too much to sell, and it has lots of sentimental values. Hence I decided to ship it to here. Ed already has a laptop and a desktop in Toronto. Including my recent purchase of a laptop for my frequent travels, we have a total of four computers at home now ! I was just talking about environmental issues yesterday and today I realised we have four computers for only two persons ! Before the arrival of my IMAC, when Ed came home from work, he would sit in front of his desktop and I would continue sitting in front of his laptop. We would surf online most nights. Now, my IMAC is here, it is even worse ! Now, we have our own desks for our own computers. So, we sit at separate corners surfing at night. My mother is worried and wonder if we still talk to each other. Haa ! Yeah. Of course, we still do talk! Nonetheless, what a ridiculous lifestyle we have !